Not fit for purpose on any surface other than those above. Gives way on loose soil. Slips on roots & rocks. Heavy for a TLR tyre. Gary Fisher may as well have issued slicks; crazy choice of tyre for such a burly bike (Roscoe). For a 2.4 width tyre it behaves like a 1.4 touring. Great dry grip. Extremely fast roller! Running these on a Jekyll 3000. 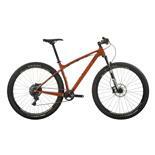 Great for straight climbs and dry xc trails. Not very good on wet or damp corners, especially with loose rock or shale. Seems the tires side walls are weak and flex no matter the air pressure. 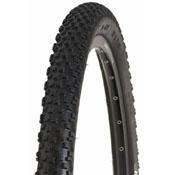 Recommend these tires for light xc or even rails to trails. 3 flames for aggressive xc riding. Poor cornering traction, not great in muddy conditions. Sudden loss of air pressure when run tubeless. 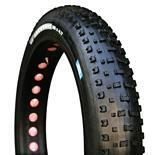 Be very wary of these tires if you plan on running them tubeless! They do roll well but their cornering traction is not good. Climbing and braking they work okay but overall traction is poor and it does not make up for it despite their rolling ability. As others have experienced I had a sudden loss of air pressure which resulted in a crash. I had just railed a nice berm at speed and as I tried to straighten the bike out it was very difficult to control. I scrubbed up against the side of trail and then it was over the handle bars. Apparently when I railed the berm the tire burped and lost most of its air pressure so when I tried straightening out the tire was literally flopping from side to side on the wheel. I had ridden these tires about 800km tubeless without incident but when it did let go it let go suddenly. When I switched to a new set of tires I realized how much I was losing in traction and cornering compared to theses tires. I can't recommend these tires when there are so many other good options. Michelin Wild Racer, Schwalbe Racing Ralph. SUPER FAST ROLLING. I am not kidding. Mount this tubeless and you will fly. Grip is minimal. Breaking power is lacking big time. Cornering on these, is more of a slip-slidin' away business. These came on my bike. Any type of cornering with the rear break on, will make it slide. Do not inspire confidence while cornering or breaking. I rode in sandy or hardpack conditions and they behave the same. They mount UST super easy. Put them on the rim, put the compressor, and it's done. 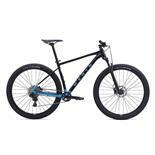 At 20psi front and 25 psi rear, they absorb bumps, roots and ride rock gardens no problems. I did, roll my front one off the rim once, but it was my fault (way to fast and way to sharp corner and running 18 psi). So, while they are super fast rolling (fast overall), I don't like them. They are not grippy enough for me. Tyres roll really well on hard pack. These tyres do not like any loose gravel corners, they wash out. Riding 29' American Classic rims,with XDX tubeless convertion I had a massive blow out on the front, luckly I was climbing at the time and was able to stay up right. This happened more than once even after changing the tyres. Very dissappointed with these tyres. Don,t feel safe riding them. Can not corner with any form of confidence. Braking on steep down hill slops, tyres wash out and just don't stop. Withh burp and fold on you running tubeless. Using 29er version. Rode these tires for 6 months. 3 of the months with tubes and with the tubes I never felt right cornering or going up slightly muddy hills, they would not get traction. Then I went tubeless, and these tires burped on 3 occasions letting all the air out. The tire is not strong and buckles. Unfortunately I was going down a rocky downhill when the tire buckle/burped letting all the air out and I crashed. I swore I broke my leg but I just got really hurt, luckily nothing broke. USE THESE TIRES WITH EXTREME CAUTION. This is not just me, my buddy rides these tires and he experience the same thing more then once. I am now running Mountain Kings and I am happy. 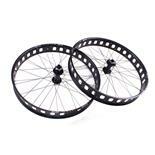 Excellent rolling resistance, great traction in all types of NC weather and terrain, light. Difficult to mount on Olympic ZTR rims. hooks up well as a rear. price for a tubeless ready tire is excellent. Geax tnt tires are the same price and come nowhere close in performance out here. none so far. Bigger nobs than the racing ralph, probably cause a little more rolling resistance, but it is negligible. Sidewalls seem to be thin, but not as thin as Specs 2-bliss sidewalls. i bombed down thru sharp rocks on bell and had zero issues. seems to be a decent cheaper alternative to the schwalbe racing ralphs. They grip quite well as a rear and rail corners to the point where i dont feel like i am even pushing them. I was climbing up prospector in the mcdowells and it just seemed to dig down and hook up without slipping whatsoever. Going to get another one and run it on the front. racing ralphs for the tread and about a handful of others in my never ending quest to find a good set of tires. Rolls very nicely on hard surfaces and gives consistent grip. Work suprisingly well in snow. Less than perfect grip in wet conditions. Much better tyre than first impressions might indicate. Very good for all around biking. 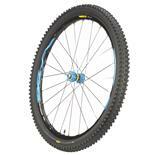 Maxxis Minion, Swable Nobly Nic. BEWARE! I have run these tires tubeless on Stan's Arch rims since I purchased them a year ago. I'm 190 lbs and run a full suspension GF. After installing and putting in the Stan's sealant and letting them sit overnight I took them out on the first ride, running them in the 25-30 psi range, and unbelievably, near the end of the ride, the rear tire blew completely off the rim. Luckily it was on a climb. Sounded like a shotgun blast and sealant went everywhere, but most noticeably the backs of my legs. The tire was intact, so I remounted it using a tube, rode home and returned it to my LBS. They replaced the tire without questions, and I had no problems for 11 months. On my most recent ride the rear tire finally decided to blow off AGAIN, this time at high speed, and I'm lucky I didn't kill myself AND the dude behind me. He commented on the aerosolized sealant mist cloud the blowout produced, and was surprised I managed to stop without a crash using only the front brake and the tireless rear rim. Again, tire was completely intact and was remountable, but feel that a burp of this magnitude is entirely unacceptable, not to mention scary as h*ll. Again, I was running them in the 30 psi range, so maybe that's too high. No more Bontragers for me. As long as they stayed on the rim I was reasonably satisfied with their performance, but feel there are MANY better TLR tires to choose from.